6.50 points at 8 votes (rank 510). 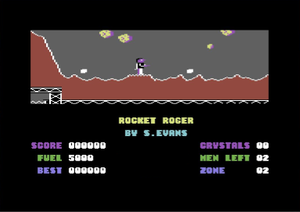 The graphics of the game are colourful and diversified, however, there is no music. The sound is limited to the sounds when you e.g. 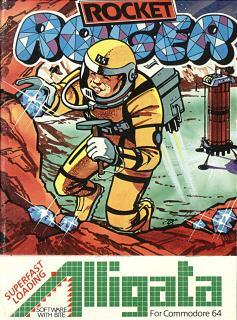 activate the jet pack or fire the hand laser, as well as hall effects when collecting the crystals and suchlike. The game area is shown as a section the size of approx. half a screen, which smoothly scrolls into all four directions. 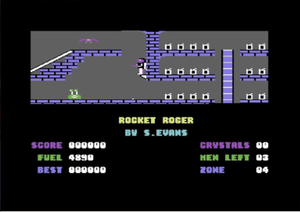 The hero is controlled by joystick, an early version of the game could only be controlled by keyboard. ... Beware of meteorits ! The games starts with leaving the spaceship at the surface of the planet. Here, you need to avoid numerous dangers as vulcano erruptions, meteor showers and miniature UFOs to finally reach the entrance to the underground zones. When changing from one zone to the next the background colour of the landscape changes and the enemies from the zone that you just left disappear, if they are still there. At certain locations there are flashing markers on the ground or at a different safe place. When touching these hotspots, the location is set as a new starting point for the further course of the game. If Roger now loses a life, the game is continued at the hotspot that was last touched. Down into the depth of the planet. There are different places within the underground archs where you can fill up your fuel supply for the jet pack by collecting the fuel cans that are placed there. Roger is followed by the guard. Basically, you should not linger in a zone for too long, because otherwise a guard in the shape of a rotating black ball will appear after approx. 25 seconds and will chase the poor Roger until it inveitably catches up with him and takes one of his 5 lives. 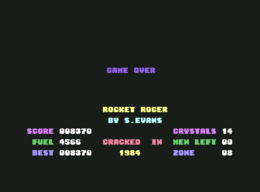 The difficulty grade of the game is rather high, as the controls of the jet pack need some practice. Contact with obstacles, energy barriers and suchlike leads equally to the loss of a life as the collision with enemies of all types. Some of these enemies can be eliminated with the hand lasers, other on the other hand not. Added to this is, that many of the required crystals are at the ceiling of caves or other hard to reach places, and can only be accessed by careful manouevring while hovering, whereby the time limit to leave each zone and the limited fuel supply needs to be taken into account. After each 10.000 points you get an extra life. POKE 18193,44: POKE 18190,44 --> Unlimited number of lives. 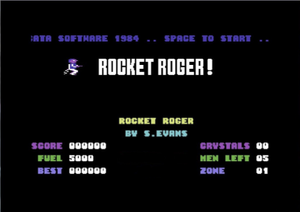 Flodder: "Rocket Roger was one of my first games for the C64. Until now it has lost nothing of its esprit but also nothing of its almost brazen difficulty grade. Controlling the jet pack is an art for itself, only a littelle bit too much or less thrust and - boom ! And the mere 5 lives are used up very quickly. 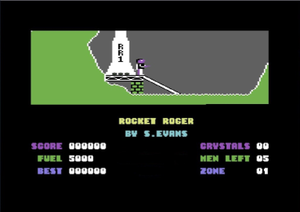 For a game from 1984, the graphics are rather appealing, only a bit background music would not have been amiss. A game that I like taking out every now and then." The games was only published on cassette, but it already contained a fastloader at that time to shorten the loading times. 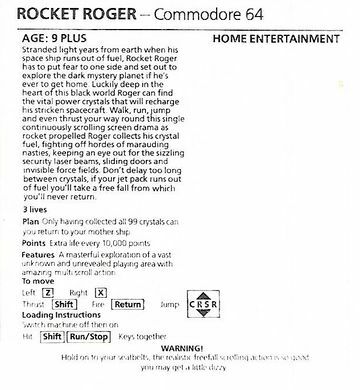 There are several different original versions of Rocket Roger. 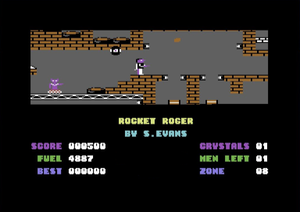 The original edition only had keyboard controls and the hero had only three lives. 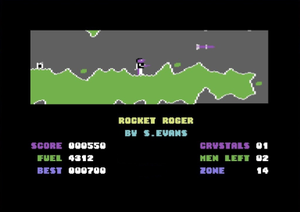 Later versions were controlled by joystick, the enclosed manual, however, still described the (now disfunctional) keyboard controls and the three lives, although now there were five. Another version of the game had two selectable difficulty grades ("Amateur" and "Professional"), and finally there is at least one more version with a tutorial ("Instructions"). This page was last modified on 28 January 2018, at 00:15.